But the plan doesn't identify which tax breaks would be removed to offset the lost revenue. WASHINGTON — Republican leaders on Wednesday proposed slashing tax rates for the wealthy, the middle class and businesses while preserving popular tax deductions that encourage buying homes and giving to charity, hoping to unify the party behind a proposal to revamp the U.S. tax code. But the nine-page framework they released to kick off negotiations left many key questions, including how they plan to avoid adding trillions of dollars to the government’s debt. The framework leans heavily on limiting taxes paid by the wealthiest Americans, such as the alternative-minimum tax, and opposition to such changes from Democrats suggests it will be a battleground as negotiations intensify. The “unified framework” was meant to serve as a starting point for negotiations on a tax deal, which lawmakers hope to complete by the end of the year. Republican leaders now must resolve controversial questions to unite their party – and possibly some Democrats – behind tax legislation, such as what corporate tax breaks to protect and how much revenue they are willing to lose in pursuit of new economic growth. There were few initial estimates of what the tax framework might mean for economic growth, an area that will probably divide Republicans who support the plan and Democrats who immediately complained that the changes would disproportionately benefit the wealthy. The White House and Republican leaders negotiated for months and agreed in large part only on the taxes they want to cut. They now face the more arduous task of agreeing on which tax deductions to take away, a process sure to pit party members against each other and put them under extreme pressure from outside lobbying groups fighting to protect their favored tax breaks. In Indiana, Trump threatened to try to oust Democrats who don’t vote to turn the tax cuts into law. He singled out Sen. Joe Donnelly, Ind., who is up for re-election next year, as a Democrat who would be targeted if he didn’t sign on to the plan. “We will come here, we will campaign against him like you wouldn’t believe,” Trump said. Democratic leaders will try to keep their party united in opposition, and on Wednesday they charged Republicans with proposing a huge tax cut to the wealthy but offering little for anyone else. They said there is little evidence the tax plan provides any tax relief for low-income Americans, and it couldn’t be learned how much the middle class would benefit. Republicans didn’t specify what tax rates would apply to certain income levels, making it hard to determine the framework’s impact. In their blueprint, Republican proposals include cutting the corporate tax rate from 35 percent to 20 percent and making it much easier for multinational companies to bring money earned overseas into the United States. That is roughly in line with a longstanding House Republican goal, though Trump has consistently pushed for the corporate rate to be lowered to 15 percent. 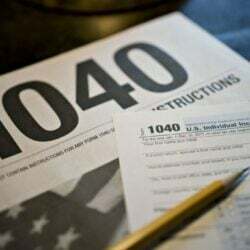 The framework would roughly double the standard deduction that married families and individuals use to reduce their taxable income, a change that Republicans hope will simplify the filing system. But it would also eliminate the “personal exemption” taxpayers can claim, blunting much of the new benefit and potentially leading some middle-class households with multiple family members to pay more taxes than they now do. Republicans also are holding out the possibility of imposing a new, higher tax rate on the wealthy to ensure that the tax changes do not disadvantage the middle class, though the White House and Republican leaders have not agreed on how that would work. Many of the tax changes would benefit upper-income Americans. 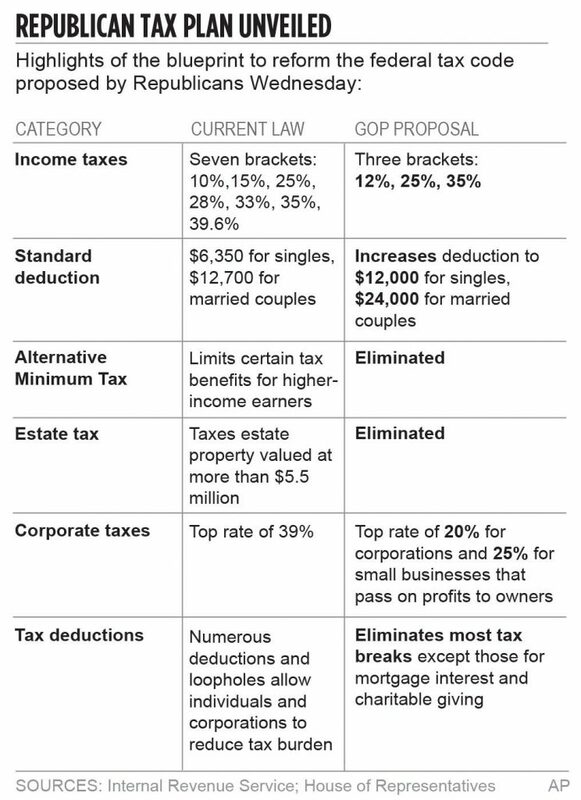 The Republicans propose eliminating the estate tax and the alternative minimum tax. They also proposed lowering taxes on investment income. The tax framework does not mention Trump’s longstanding promise to raise taxes on hedge fund managers, suggesting that differences on that point have not been resolved. The next step for congressional Republicans is to pass a budget resolution that would allow a tax bill to pass the Senate with a 51-vote majority. Senate bills often need 60 votes to overcome a filibuster, but the budget resolution would allow Republicans to use the process known as “reconciliation” to avoid that higher threshold. Sen. Patrick Toomey, R-Pa., said Wednesday that the Senate Budget Committee is expected to send a draft budget to the Senate floor next week. Once the budget resolution passes both chambers, the tax-writing committees – Senate Finance and House Ways and Means – would begin drafting and amending tax legislation, where the politically thorny work of identifying revenue offsets would take place. “Those are two big ones that have to be on the table,” Toomey said. Business groups, which have already been leaning heavily on lawmakers to protect their favored tax breaks, had mixed reactions to the plan. Many cheered the general direction of the plan but made clear they were watching how Congress approached key unresolved details. “Now, we are entering into a crucial new phase of the effort to overhaul the tax code, and the hardest work is just beginning,” U.S. Chamber of Commerce President Thomas Donohue said in a statement. House Ways and Means Committee chairman Kevin Brady, R-Texas, will visit the Chamber on Thursday to discuss the plan. “We encourage policymakers to remove corporate welfare provisions from the code. Wherever possible, loopholes, deductions, exemptions and other handouts should disappear. We maintain that cutting rates is the most reliable pathway to growth,” wrote Philip Ellender, president of government and public affairs at Koch Companies Public Sector. The National Association of Realtors denounced the blueprint, saying in a statement Wednesday that the proposal to double the standard deduction would “all but nullify the incentive to purchase a home” for most taxpayers. With the standard deduction doubling, more homeowners would probably use that deduction when they filed their tax returns, rather than taking advantage of the lucrative mortgage interest deduction. “We also recognize we’re in the opening stages of what is going to be a long fight, a long journey, to realize tax reform – so as the opening play in this, we feel good about continuing to move forward,” Tobin said.